Why are China's doctors dropping dead? In a single week in 2013, four doctors died suddenly of cardiac arrest. Meanwhile in the last two years it has been reported that fifteen anesthetists in their thirties and forties had sudden cardiac deaths. There have even been premature deaths among distinguished surgeons. What's going on? According to Dr Huang Weimin, an orthopaedic surgeon at the General Hospital of Jinan Military Region in Shandong, doctors are simply being worked to death. It's the Chinese medical equivalent of karoshi (death from overwork). The Chinese and Japanese characters are the same: "过劳死" (Guolaosi). 1. Excessive hours and work intensity. Doctors work up to 12 hours a day and in general at least 50 hours a week. 2. Extra non-clinical duties. Doctors are required to publish a quota of scientific articles every year to remain qualified and to be eligible for promotion. This requires research, finding funds, and doing the necessary paperwork for publication. All this work must be carried out in addition to their general clinical work, often in their own time. 3. Doctors must attend many meeting and medical conferences and also have a heavy teaching and supervision burden. 4. The excessive workload and lack of time contributes to a deteriorating doctor-patient relationship, which results in more pressure on doctors and also doctor-patient disputes, litigation against doctors and violence against doctors. Dr Huang says that all these factors have been highlighted by the doctors' trade union, the Chinese Medical Doctor Association (CMDA). In May 2015 the CMDA issued a “White Paper on the Practice of Chinese Doctors” which called for an easing of pressure on doctors. It noted that more pressure on doctors can be expected with China's ageing population, the increase in prosperity and consumer expectations, and the widening of medical insurance coverage. 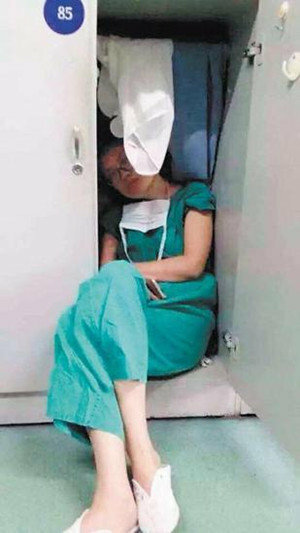 "The growing rates of sudden death indicate that doctors in China are already exhausted and they need alleviation of the heavy burdens. It is high time to concern the health of doctors," writes Dr Huang. "On one hand, the government should optimize the allocation of medical resources, improve medical evaluation systems, and legislate to protect the health of medical staffs. On the other hand, the society should give more understanding to doctors and create a favorable working conditions."